NHL News : Breaking: Bruins officially confirm injury to Tuukka Rask. Breaking: Bruins officially confirm injury to Tuukka Rask. Bad news from the Bruins. The Boston Bruins have just shared some bad news, although most people who are paying attention were likely expecting it by now. According to an official report from the Bruins organization star goaltender Tuukka Rask has in fact been injured and will not return to the game this evening. 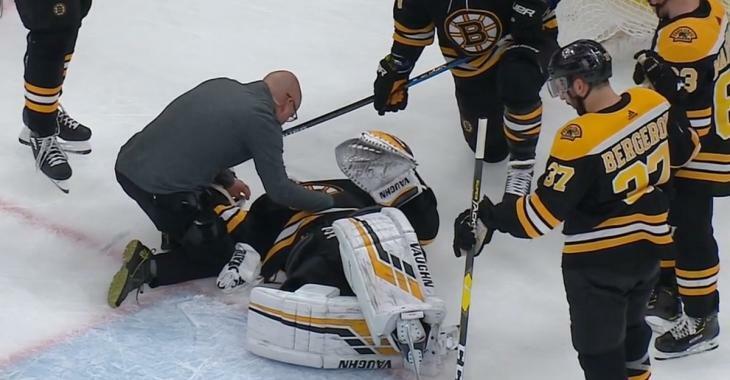 The injury is being reported as a concussion and that comes as no surprise given just how rocked Rask appeared to be when he was being helped off the ice by his fellow Boston Bruins teammates. The Bruins goalie was injured when a terrific play from Rangers forward Filip Chytil ended with a bump from Bruins defenseman Charlie McAvoy. Chytil made a charge for the Bruins net as he tried to find the back of the net, and although his attempt at scoring was successful, just prior to getting the puck off of his stick he was bumped ever so slightly by McAvoy. The net would come completely dislodged which is of course a good sign for Raks and the Bruins, the net is designed to come off it's moorings to reduce the impact on the player colliding with it, but in spite of that Rask would stay down on the ice for several long moments. The Bruins star would lay there not moving for a long time before eventually showing some signs of life again but it was clear that the veteran was not in a good way. Concussions are obviously treated very seriously in the modern NHL and this unfortunately looks like it may be a bad one. You can see the full sequence in the video below.